Nothing really to complain about, staff is super cute and always willing to help you. They clean the dorms and bathrooms once a day, so everything was clean. You have a locker for your big backpack and curtains on your bed. Best thing is of course the free beer! Everyone comes together, and Edward is always super nice with everyone! Would come again if I go back to Hanoi. In a really nice location in the old quarter. Free beer in the evenings which is really good to meet people. Really comfy beds, nice bathrooms (but cold showers for two nights) breakfast is good and the staff are great. Good location but still quiet from the street. Free beer is great to get people together, just be aware it is absolute poison! Clean and nice dorms. Showers were amazing. Staff is great, helped me book buses and tours. They also let me take a shower before a night bus even though I had checked out in the morning. Only thing is that the lobby area is quite small especially when people check out and leave their bags in the corner. I would stay here again. Really nice rooms with big beds and curtains. Huge lockers and the shower was one of the best we’ve had on our trip. Great location in the old quarter but also quiet as it’s down an alley. Would recommend! Good location. Staff were friendly but my floor had no hot water for 5 days meaning cold showers or using showers on other floors. Breakfast was average. Beds were comfy but girl above me had hair on her sheets. Bathroom starts to smell if you don’t keep the fan on. Common area is extremely small - wouldn’t recommend for solo travellers. it’s okay for a night but nothing more. 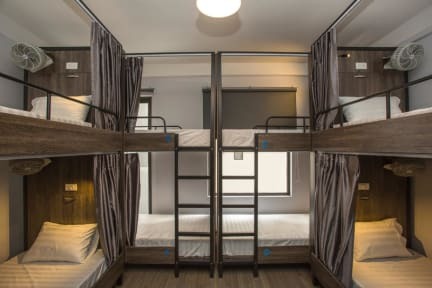 Overall, Hostel was alright but there are much better alternatives for the same price like Old Quarter View Hostel. The hostel itself is really your typical hostel, everything is clean, the staff are nice, the breakfast has some options. 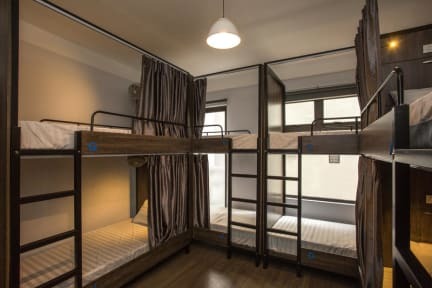 However it is in the old quarter which now I understand is the party scene, so most any cheap hostel in this area is going to attract certain people. There are plenty of nice people we enjoyed talking to and plenty that sort of minded their own business, but then there are the frat boys that go out, get drunk, the people smoking in the room etc. also no hot water. The staff, location are great but they wouldn’t fix the sink leak in our bathroom albeit multiple people in the dorm room went and notify them. Each time someone uses the bathroom the sink water almost just went straight into the floor. I wouldn’t stay again.